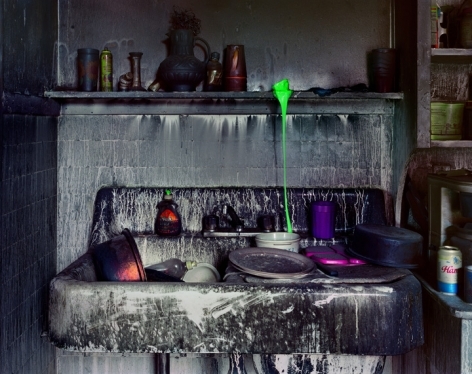 Fuel Oil, from the series Detroit, 2008. Chromogenic print. Available at 30 x 40, 40 x 50, 50 x 60, or 70 x 90 inches, edition of 5. 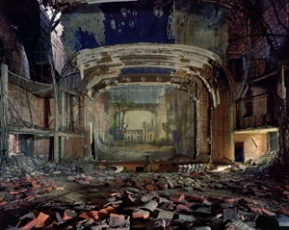 Palace Theater, Gary Indiana, from the series Detroit, 2008. Chromogenic print. Available at 30 x 40, 40 x 50, 50 x 60, or 70 x 90 inches, edition of 5. National Time, from the series Detroit, 2008. Chromogenic print. Available at 40 x 30, 50 x 40, 60 x 50, or 90 x 70 inches, edition of 5. 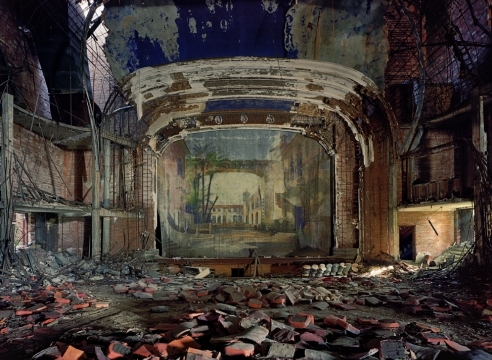 The Rouge, from the series Detroit, 2008. Chromogenic print. Available at 30 x 40, 40 x 50, 50 x 60, or 70 x 90 inches, edition of 5. 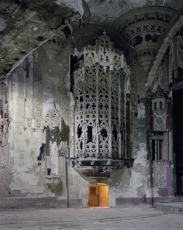 Organ Screen, from the series Detroit, 2008. Chromogenic print. Available at 40 x 30, 50 x 40, 60 x 50, or 90 x 70 inches, edition of 5. Campo Amor Oesta, from the series Cuba, 1998. Chromogenic print. Available at 30 x 40 inches, edition of 10, or 40 x 50 inches, edition of 5, or 50 x 60 inches, edition of 3, or 70 x 90 inches, edition of 3. Aurora, from the series Detroit, 2008. Chromogenic print. Available at 30 x 40, 40 x 50, 50 x 60, or 70 x 90 inches, edition of 5. Dry Dock, from the series Detroit, 2008. Chromogenic print. Available at 40 x 30, 50 x 40, 60 x 50, or 90 x 70 inches, edition of 5. Lee Plaza, 2008, from the series Detroit, 2008. Chromogenic print. Available at 40 x 30, 50 x 40, 60 x 50, or 90 x 70 inches, edition of 5. Model-T Headquarters, from the series Detroit, 2008. Chromogenic print. Available at 30 x 40, 40 x 50, 50 x 60, or 70 x 90 inches, edition of 5. 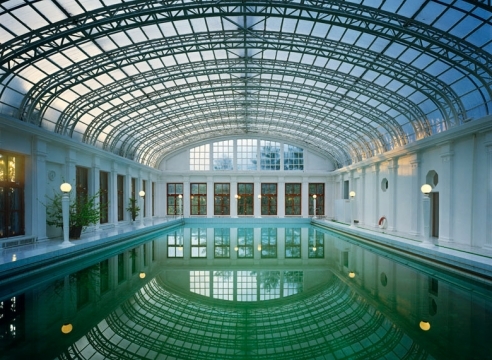 Ukrainian Swimming Pool, from the series Russia, 2003. Chromogenic print. Available at 30 x 40 inches, edition of 10, or 40 x 50 inches, edition of 5, or 50 x 60 inches, edition of 3, or 70 x 90 inches, edition of 3. Room 348, Hermitage Museum, from the series Russia, 2003. Chromogenic print. Available at 30 x 40 inches, edition of 10, or 40 x 50 inches, edition of 5, or 50 x 60 inches, edition of 3, or 70 x 90 inches, edition of 3. Red Piano, Pioneer Camp Artek, Yalta, from the series Russia, 2003. Chromogenic print. Available at 30 x 40 inches, edition of 10, or 40 x 50 inches, edition of 5, or 50 x 60 inches, edition of 3, or 70 x 90 inches, edition of 3. Amber Room, from the series Russia, 2003. Chromogenic print. Available at 40 x 30 inches, edition of 10, or 50 x 40 inches, edition of 5, or 60 x 50 inches, edition of 3, or 90 x 70 inches, edition of 3. Opera House, Irkutsk, from the series Russia, 2003. Chromogenic print. Available at 30 x 40 inches, edition of 10, or 40 x 50 inches, edition of 5, or 50 x 60 inches, edition of 3, or 70 x 90 inches, edition of 3. Abandoned Church, from the series Russia, 2003. Chromogenic print. Available at 30 x 40 inches, edition of 10, or 40 x 50 inches, edition of 5, or 50 x 60 inches, edition of 3, or 70 x 90 inches, edition of 3. 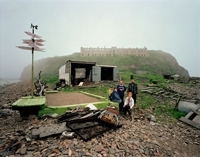 Restoration Studio, from the series Russia, 2003. Chromogenic print. Available at 30 x 40 inches, edition of 10, or 40 x 50 inches, edition of 5, or 50 x 60 inches, edition of 3, or 70 x 90 inches, edition of 3. Fire Curtain, Liberty Theater, from the series New York, 1996. Chromogenic print. Available at 40 x 30 inches, edition of 10, or 50 x 40 inches, edition of 5, or 60 x 50 inches, edition of 3, or 90 x 70 inches, edition of 3. Torreon de Santa Cruz del Norte, from the series Cuba, 1999. Chromogenic print. Available at 30 x 40 inches, edition of 10, or 40 x 50 inches, edition of 5, or 50 x 60 inches, edition of 3, or 70 x 90 inches, edition of 3. Bosque de Habana, from the series Cuba, 1999. Chromogenic print. Available at 30 x 40 inches, edition of 10, or 40 x 50 inches, edition of 5, or 50 x 60 inches, edition of 3, or 70 x 90 inches, edition of 3. Chiminea, Calle Reina, Havana, from the series Cuba, 1999. Chromogenic print. Available at 40 x 30 inches, edition of 10, or 50 x 40 inches, edition of 5, or 60 x 50 inches, edition of 3, or 90 x 70 inches, edition of 3. Doctor Triolet, Matanzas, from the series Cuba, 2000. Chromogenic print. Available at 40 x 30 inches, edition of 10, or 50 x 40 inches, edition of 5, or 60 x 50 inches, edition of 3, or 90 x 70 inches, edition of 3. Red House White Sea, from the series Russia, 2003. Chromogenic print. Available at 30 x 40 inches, edition of 10, or 40 x 50 inches, edition of 5, or 50 x 60 inches, edition of 3, or 70 x 90 inches, edition of 3. Locomotive Theater, from the series Russia, 2003. Chromogenic print. Available at 30 x 40 inches, edition of 10, or 40 x 50 inches, edition of 5, or 50 x 60 inches, edition of 3, or 70 x 90 inches, edition of 3. Margarita, Havana, from the series Cuba, 2000. Chromogenic print. Available at 40 x 30 inches, edition of 10, or 50 x 40 inches, edition of 5, or 60 x 50 inches, edition of 3, or 90 x 70 inches, edition of 3. Sillas Verdes, Havana, from the series Cuba, 1999. Chromogenic print. Available at 40 x 30 inches, edition of 10, or 50 x 40 inches, edition of 5, or 60 x 50 inches, edition of 3, or 90 x 70 inches, edition of 3. 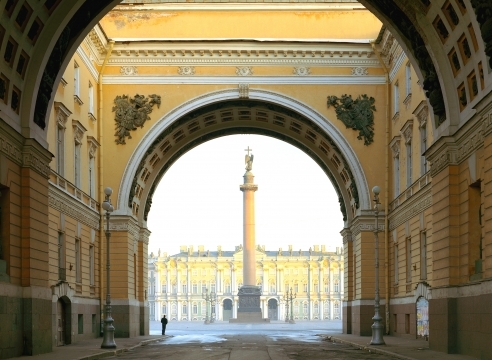 Palace Square, St. Peterburg, from the series Russia, 2003. Chromogenic print. Available at 30 x 40 inches, edition of 10, or 40 x 50 inches, edition of 5, or 50 x 60 inches, edition of 3, or 70 x 90 inches, edition of 3. 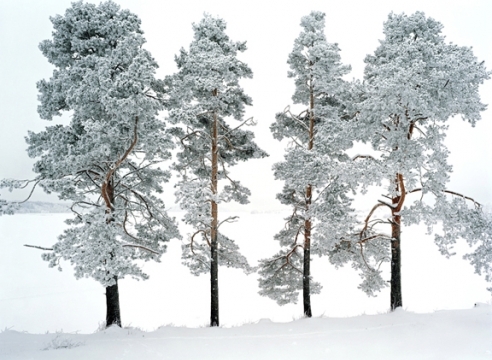 Rotari Gallery, from the series Russia, 2003. Chromogenic print. Available at 40 x 30 inches, edition of 10, or 50 x 40 inches, edition of 5, or 60 x 50 inches, edition of 3, or 90 x 70 inches, edition of 3. Casa de Vincente Borges, from the series Cuba, 1999. Chromogenic print. Available at 40 x 30 inches, edition of 10, or 50 x 40 inches, edition of 5, or 60 x 50 inches, edition of 3, or 90 x 70 inches, edition of 3. Baron's Library, Noto Sicily, 2004. Chromogenic print. Available at 40 x 30 inches, edition of 10, or 50 x 40 inches, edition of 5, or 60 x 50 inches, edition of 3, or 90 x 70 inches, edition of 3. Hall of 1812, from the series Russia, 2003. Chromogenic print. Available at 30 x 40 inches, edition of 10, or 40 x 50 inches, edition of 5, or 50 x 60 inches, edition of 3, or 70 x 90 inches, edition of 3. Vedado Azul, from the series Cuba, 2001. Chromogenic print. Available at 30 x 40 inches, edition of 10, or 40 x 50 inches, edition of 5, or 50 x 60 inches, edition of 3, or 70 x 90 inches, edition of 3. Calle Bayona, Havana, from the series Cuba, 1998. Chromogenic print. Available at 30 x 40 inches, edition of 10, or 40 x 50 inches, edition of 5, or 50 x 60 inches, edition of 3, or 70 x 90 inches, edition of 3. Campo Amor Este, from the series Cuba, 1998. Chromogenic print. Available at 30 x 40 inches, edition of 10, or 40 x 50 inches, edition of 5, or 50 x 60 inches, edition of 3, or 70 x 90 inches, edition of 3. Courtyard, Cass Tech, from the series Detroit, 2008. Chromogenic print. Available at 30 x 40, 40 x 50, 50 x 60, or 70 x 90 inches, edition of 5. Peacock Alley, from the series Detroit, 2008. Chromogenic print. Available at 30 x 40, 40 x 50, 50 x 60, or 70 x 90 inches, edition of 5. Packard Roof, from the series Detroit, 2008. Chromogenic print. Available at 40 x 30, 50 x 40, 60 x 50, or 90 x 70 inches, edition of 5. Central Station, from the series Detroit, 2008. Chromogenic print. Available at 40 x 30, 50 x 40, 60 x 50, or 90 x 70 inches, edition of 5. 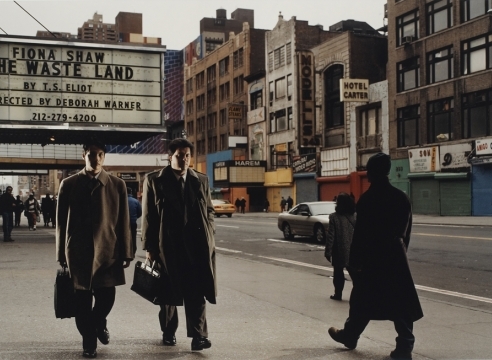 Contact, Times Square, from the series New York, 2002. Chromogenic print. Available at 30 x 40 inches, edition of 10, or 40 x 50 inches, edition of 5, or 50 x 60 inches, edition of 3. Duffy Square, Times Square, from the series New York, 2002. Chromogenic print. Available at 30 x 40 inches, edition of 10, or 40 x 50 inches, edition of 5, or 50 x 60 inches, edition of 3. Farmer's Table, Sicily, 2004. Chromogenic print. Available at 30 x 40 inches, edition of 10, or 40 x 50 inches, edition of 5, or 50 x 60 inches, edition of 3, or 70 x 90 inches, edition of 3. Red Chairs, Selwyn Theater, from the series New York, 1996. Chromogenic print. Available at 40 x 30 inches, edition of 10, or 50 x 40 inches, edition of 5, or 60 x 50 inches, edition of 3, or 90 x 70 inches, edition of 3. Target, Times Square, from the series New York, 2002. Chromogenic print. Available at 40 x 30 inches, edition of 10, or 50 x 40 inches, edition of 5, or 60 x 50 inches, edition of 3. Rule The Planet, Times Square, from the series New York, 2002. Chromogenic print. Available at 30 x 40 inches, edition of 10, or 40 x 50 inches, edition of 5, or 50 x 60 inches, edition of 3. City Hall Dome, from the series New York, 2000. Chromogenic print. Available at 40 x 30 inches, edition of 10, or 50 x 40 inches, edition of 5, or 60 x 50 inches, edition of 3, or 90 x 70 inches, edition of 3. Birdman, Hanoi, from the series Vietnam, 2007. Chromogenic print. Available at 30 x 40 inches, edition of 10, or 40 x 50 inches, edition of 5, or 50 x 60 inches, edition of 3. Car Wash Cafe, from the series Detroit, 2008. Chromogenic print. Available at 30 x 40, 40 x 50, 50 x 60, or 70 x 90 inches, edition of 5. Casino Rooftop, Asbury Park, from the series New York, 2002. Chromogenic print. Available at 30 x 40 inches, edition of 10, or 40 x 50 inches, edition of 5, or 50 x 60 inches, edition of 3. Bob-Lo Boat, from the series Detroit, 2008. Chromogenic print. Available at 30 x 40, 40 x 50, 50 x 60, or 70 x 90 inches, edition of 5. 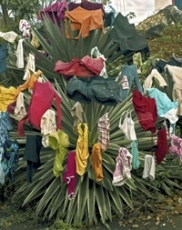 Rosa en la Tropical, from the series Cuba, 2000. Chromogenic print. Available at 40 x 30 inches, edition of 10, or 50 x 40 inches, edition of 5, or 60 x 50 inches, edition of 3, or 90 x 70 inches, edition of 3. Sea of Fog, Denmark, 2006. Chromogenic print. Available at 30 x 40 inches, edition of 10, or 40 x 50 inches, edition of 5, or 50 x 60 inches, edition of 3, or 70 x 90 inches, edition of 3. Caneros, Las Tunas, Cuba, 1999. Chromogenic print. Available at 30 x 40 inches, edition of 10, or 40 x 50 inches, edition of 5, or 50 x 60 inches, edition of 3, or 70 x 90 inches, edition of 3. La espera, Cayo Granma (Ferry Terminal), Santiago de Cuba, 2012. Chromogenic print. Available at 30 x 40 inches, edition of 10, or 40 x 50 inches, edition of 5, or 50 x 60 inches, edition of 3, or 70 x 90 inches, edition of 3. Majagua, Valle de los Ingenios, 2002. 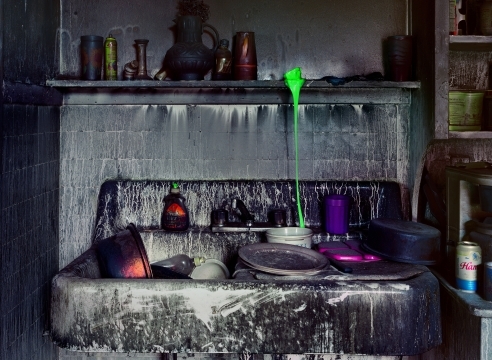 Chromogenic print. Available at 30 x 40 inches, edition of 10, or 40 x 50 inches, edition of 5, or 50 x 60 inches, edition of 3, or 70 x 90 inches, edition of 3. 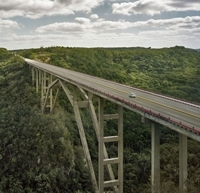 Puente de Bacunayagua, Via Blanca, Cuba, 2012. Chromogenic print. Available at 30 x 40 inches, edition of 10, or 40 x 50 inches, edition of 5, or 50 x 60 inches, edition of 3, or 70 x 90 inches, edition of 3. Andrew Moore investigates the intersections of historical moments found within specific locations. 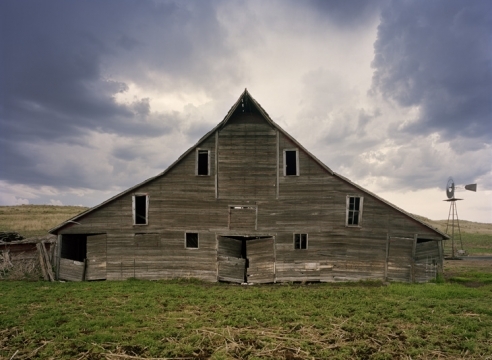 Through his vividly colored, large-scale photographs of architectural structures and landscapes across the world, including Cuba, Russia, Detroit, and the Great Plains of the American West, Moore captures a strong sense of place while also complicating our linear understanding of time. In the Detroit series of decaying and derelict urban structures, the viewer becomes intensely aware of the passing of the years and the impact of economic depression. Yet, more than this, these environments seem to exist outside of temporal limits. We see dense foliage enveloping an old car wash, and a grove of birch trees growing from the ashes of books in a former storage facility, speaking not only to the forces of decomposition but also to the power of transformation and renewal. Moore shows us that human existence takes place within a much longer timeline and a wider context than we are able to control. This is powerfully captured in his more recent series, Dirt Meridian, in which buildings and remnants of habitation appear as isolated objects within the seemingly limitless landscape of the West. Born in Connecticut in 1957, Moore lives and works in New York City. Since 2004 he has taught in the MFA photography program at the School of Visual Arts, and from 2001-2010 he was a visiting lecturer at Princeton University. Numerous prominent institutions have held solo exhibitions of Moore’s work, including the Akron Art Museum, the Queens Museum of Art, New York, the Grand Rapids Art Museum, Colby College Museum of Art, and the National Building Museum, Washington D.C. In 2014 he was a recipient of the John Simon Guggenheim Memorial Foundation Fellowship. Moore’s work is represented in numerous public collections in the United States and internationally, including the Metropolitan Museum of Art, New York, the Whitney Museum of American Art, New York, the Getty Museum, Los Angeles; the Library of Congress, Washington, D.C., the Israel Museum, the San Francisco Museum of Modern Art, the Los Angeles County Museum of Art, Yale University Art Gallery, and the Detroit Institute of Arts. Four monographs of his work have been published: Inside Havana (2002, Chronicle); Russia (2005, Chronicle); Detroit Disassembled (2010, Damiani); and Andrew Moore: Cuba (2012, Damiani). The largest photography exhibition at the Ogden Museum to date, this exhibition features the work of twenty-five emerging, mid-career and established photographers. Each photographer ia individually showcased with a monographic installation focusing on a single body of work within the context of a group exhibition. All types of lens-formed imagery are included from traditional analogue and digital still photography to video installation and new media. Regional identity in an interconnected and global world is central to the exhibition’s narrative. 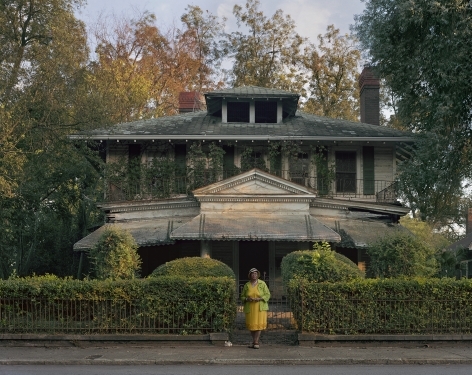 Themes and ideas addressed in New Southern Photography include: memory, the experience of place in the American South, cultural mythology and reality, deep familial connections to the land, the tension between the past and present, and the transitory nature of change in the New South. This permanent collection show of more than 80 paintings, sculptures, and works on paper will address a variety of characteristics that contribute to one’s sense of self, including civic, cultural, artistic, religious, professional, and sociopolitical identities, sense of place and personal space, and non-conformity. Portraits range from Charles Wilson Peale’s Portrait of George Washington (1783) to John Singer Sargent’s Ernest-Ange Duez (1884), Alice Neel’s Isabel Bishop (1974) and Catherine Opie’s Jo (1993). Works addressing the impact of geography upon identity include those of Matthew Jensen, Abelardo Morrell, and Dennis Oppenheim, while defining moments of social activism appear in works by Juan Sanchez, Jaune Quick-to-See Smith, Jack Whitten, and Mel Edwards. The exhibition is curated by Gail Stavitsky, MAM chief curator. 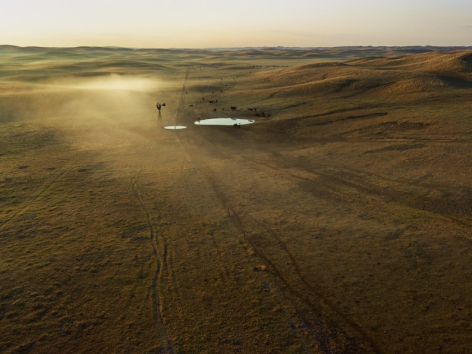 Photographer Andrew Moore has worked along the 100th meridian for the past decade, drawn to its mythic past and the people who call the High Plains home. Although literally the center of the United States, its sparse population teeters between geographic isolation and its prominent role in national and global markets for agriculture, energy, and natural resources. 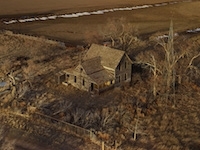 Moore sets this dynamic against the enduring myths of a quintessentially American landscape, balancing the weight of its past against a complex future. Affordable New York traces over a century of affordable housing activism, documenting the ways in which reformers, policy makers, and activists have fought to transform their city. 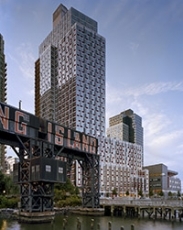 A focus on current and future housing initiatives demonstrates how New Yorkers continue to promote subsidized housing as a way to achieve diversity, neighborhood stability, and social justice. ANDREW MOORE AND DAVID MAISEL AT THE NATIONAL GALLERY OF ART, WASHINGTON D.C. The Memory of Time: Contemporary Photographs at the National Gallery of Art, Acquired with the Alfred H. Moses and Fern M. Schad Fund. 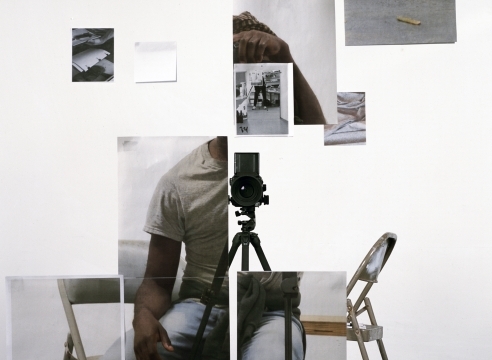 This exhibition explores the work of twenty-six contemporary artists—such as Sophie Calle (b. 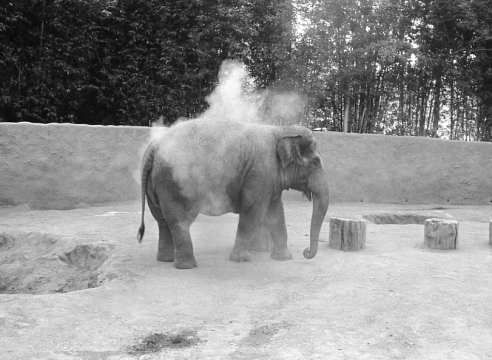 1953), Adam Fuss (b. 1961 ), Vera Lutter (b. 1960), Sally Mann (b. 1951), Christian Marclay (b. 1955), and Carrie Mae Weems (b. 1953)—who investigate the complex and resonant relationship of photography to time, memory, and history.Read more. Andrew Moore has been awarded a 2014 John Simon Guggenheim Fellowship for his photographic series, Dirt Meridian, recently on view at the gallery. 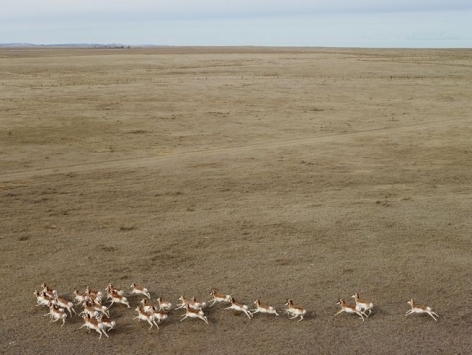 The project centers around the 100th meridian west, the longitudinal line which runs through North and South Dakota, Nebraska, Kansas, Oklahoma, and Texas, and is historically regarded as the geographic beginning of the American West. 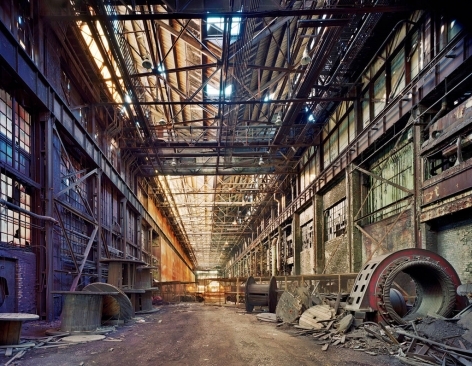 A solo exhibition of Andrew Moore's work in Russia and Detroit, entitled East/West, is on display at the List Gallery, Swarthmore College in Swarthmore, PA through February 26, 2014. ANDREW MOORE AT THE NATIONAL BUILDING MUSEUM, WASHINGTON D.C.
Detroit Disassembled: Photographs by Andrew Moore is on view currently at the National Building Museum in Washington, D.C. through February 18, 2013. The exhibition was organized by the Akron Art Museum and has previously traveled to the Queens Museum of Art, Queens, NY. On Tuesday, October 9, Andrew Moore will lecture at SVA Theater with poet Philip Levine, the 2011-2012 Poet Laureate of the United States. A Detroit native, Levine wrote the introduction to Moore's book, Detroit Disassembled. On Wednesday, October 10, 6 – 8 p.m., Yancey Richardson Gallery hosts a book signing of Moore's his new lavishly-scaled monograph, Cuba. Moore's traveling museum show, Detroit Disassembled, is on view at the National Building Museum in Washington, D.C., through February 18, 2013. 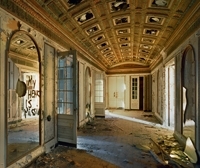 Work by Andrew Moore is featured in the photographic survey An Orchestrated Vision: The Theater of Contemporary Photography, on display at the St. Louis Art Museum through May 13, 2012. 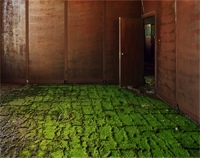 Moore's work is also featured in Structuring Nature, on display at the Joy Pratt Markham Gallery in the Walton Arts Center, Fayetteville, Arkansas from May 3 – June 30, 2012. Additionally, the artist's new book, Cuba: Photographs by Andrew Moore (1998-2012), will be released in August. 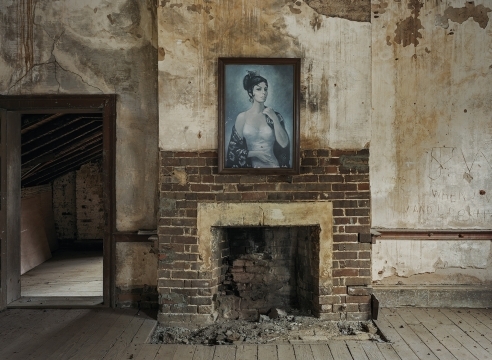 Works by Andrew Moore and Hellen van Meene are featured in the upcoming exhibition, An Orchestrated Vision: The Theater of Contemporary Photography, on display at the St. Louis Art Museum from February 19 – May 13. The museum's photographic survey includes Moore, van Meene, Edward Burtynsky, Gregory Crewdson, Nan Goldin, Andreas Gursky, Taryn Simon, Thomas Struth, and Larry Sultan, among many others. 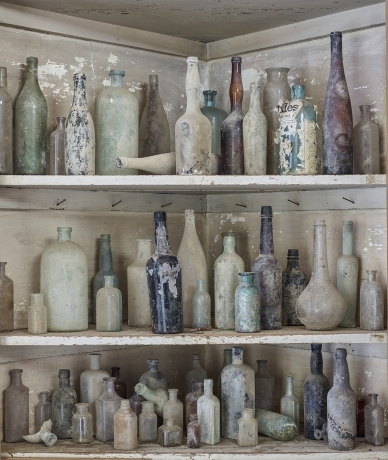 Andrew Moore's solo exhibition - Detroit Disassembled - is on display at the Queens Museum of Art through January 15, 2012. The exhibition features over thirty large-scale photos examining the current state of the Motor City, with a selection of photos from previous bodies of work hanging the museum's mezzanine. Additionally, the Boston Museum of Fine Arts recently acquired three works, one each from Moore's major series': Detroit, Cuba, and Russia. Andrew Moore's solo show - Detroit Disassembled - travels to the Queens Museum of Art this fall. The show opens August 28 and runs through January 15, 2012. Additionally, the Colby Museum of Art is presenting their extensive holdings of Moore's Detroit series in an exhibition scheduled to coincide with their show American Modern: Abbott, Evans, Bourke-White, which opened July 9. Gallery artists Mitch Epstein, David Hilliard, Lisa Kereszi, Andrew Moore, Alex Prager, and Victoria Sambunaris are all included in People Power Places: Reframing the American Landscape, a group exhibition at Davidson College, North Carolina, on view through March 6, 2011. 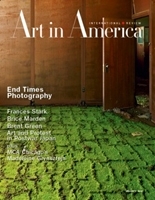 Andrew Moore's photograph Model-T Headquarters was selected as the cover image for the January issue of Art in America. 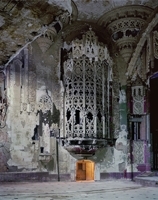 The photograph, from Moore's Detroit series, accompanies the issue's cover story, "End Times Photography" by Max Kozloff. In Fall 2011, Moore's solo museum show, Detroit Disassembled, will travel from the Akron Art Museum to the Queens Museum of Art. Andrew Moore's photographs of the Motor City are sublime—beautiful, operatic in scale and drama, tragic yet offering a glimmer of hope. They are the subject of Detroit Disassembled, an exhibition organized by the Akron Art Museum making its debut there before touring nationally. Detroit, once the epitome of our nation's industrial wealth and might, has been in decline for almost a half-century. The city is now one-third empty land—more abandoned property than any American city except post-Katrina New Orleans.